PARIS — Russia’s Proton-M heavy-lift rocket and its Breeze-M upper stage, which placed a $300 million telecommunications satellite in a useless orbit Aug. 18, is preparing to launch three more times in the next six weeks, according to the Russian space agency, Roscosmos, and the rocket’s commercial marketing company. International Launch Services (ILS) of Reston, Va., which commercializes Proton launches, is completing its own review of the Aug. 18 failure and is expected to concur with the findings of a Russian state commission that concluded a programming error was responsible. The Express-AM4 satellite owned by the Russian Satellite Communications Co. (RSCC) of Moscow and insured for about $300 million was placed into an orbit from which it may never have recovered. In the event, the satellite had its own, apparently unrelated, difficulties in communicating with ground teams, making any recovery effort impossible. RSCC has since declared the satellite a total loss. Satellite fleet operator SES of Luxembourg’s QuetzSat-1 telecommunications satellite will be next up. Its launch is set for late September, according to SES and ILS. The Proton-M/Breeze-M vehicle has scheduled the launch of the large ViaSat-1 Ka-band broadband communications satellite for mid-October. The satellite’s owner, ViaSat Inc. of Carlsbad, Calif., said Sept. 8 that ILS and ViaSat were expected to conclude their own Proton-M/Breeze-M review Sept. 9. The satellite’s shipment from manufacturer Space Systems/Loral’s Palo Alto, Calif., plant to Russia’s Baikonur Cosmodrome in Kazakhstan would then occur Sept. 13. Several commercial customers are awaiting flight. Among them is Astrium Services of Europe, which is prime contractor for the United Arab Emirates’ two-satellite Yahsat commercial and military communications system. Astrium would like the Yahsat-1B satellite to be launched before the end of this year, Astrium Services Chief Executive Eric Beranger said Sept. 9. But he conceded it was unclear whether a place could be found on the ILS manifest. 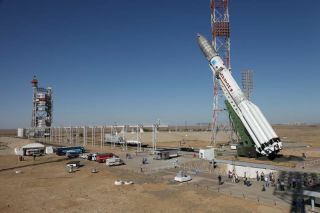 The Russian government has slated a Proton-M launch for late 2011 carrying three Glonass positioning, navigation and timing satellites.